My mailbox was literally stuffed with nail goodies last weekend (don't you love it when all your incoming packages arrive on the same day? It's like Christmas! ), so I decided to use a little bit of everything I received to create this rosy manicure. 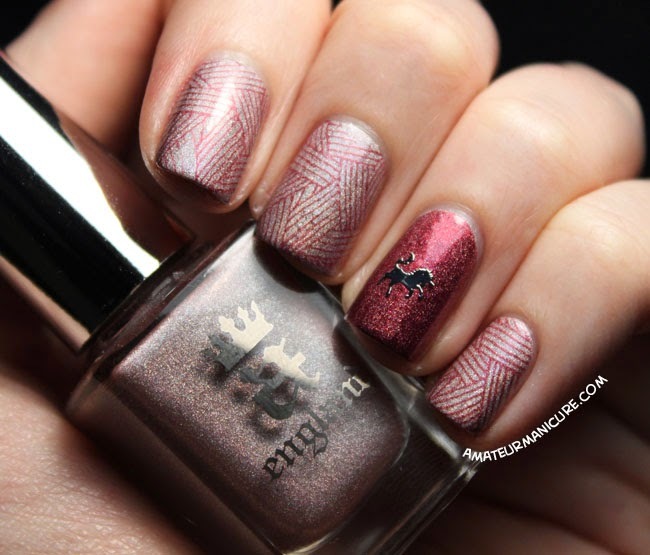 I started with a base of a-england Her Rose Adagio on the three fingers I wanted to stamp, and then used a-england Briar Rose and the MoYou Fairytale Collection plate 02 (out of stock right now, unfortunately!) to create the stripes on my pointer, middle, and pinky fingers. 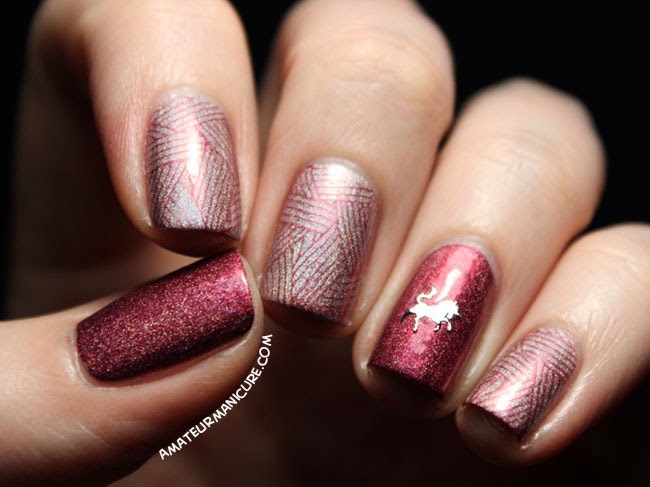 And since I'm making a special effort to work on my stamping these days, here's my confession: I originally planned to stamp my thumb, too—with the unicorn image from that plate—but it didn't go well at all. I didn't have the time to try again, so I just painted over the bad stamp job with Briar Rose and left it at that. In the end, think I like the balance of having two darker accent nails here anyway, so it all worked out for the best. 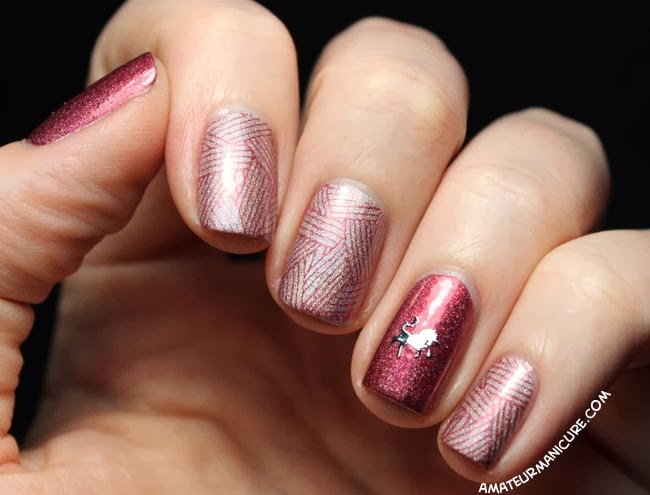 Once again, I focused on using polishes that I knew would work and only stamping a few nails to increase my chances of success. I was so excited to receive my packet of little silver unicorns from She Sells Seashells (unicorns are my favorite!) that I had to use them immediately, too. I added these to my ring fingers while the final coat of Briar Rose was still tacky, and then I sealed them in with topcoat. I did gently bend the unicorns, as She Sells Seashells suggests, but my ring fingernails are so curved that the little horns insisted on sticking out and poking me. I ended up using about three thick layers of topcoat to solve this, which was a little annoying, but didn't affect the look at all—and the unicorns stayed put nicely for the four days I wore them. I'll probably put them on a different finger and/or do a better job of bending them to the shape of my nail before I apply any polish next time. As wonderful as a-england polishes and unicorns are, however, the most exciting thing about this manicure for me is that I used my new camera to take the pictures! I'm definitely still learning the ropes and figuring out what works best with this new setup, as you can probably tell from the slightly soft focus here, but overall I'm really pleased with how these pictures turned out and I hope my photography skills will continue to improve. By far the BEST thing about the new camera is the custom white balance setting! These pictures needed no color correction whatsoever to look true to life, which is going to save me so much time and headache when processing my images. I love getting all my nail mail in one day!